Today we’d like to introduce you to Julie Stein. Jules & the Gents formed in 2006 based on a jazz band called “The Fifth Sundays”. This group had played around Atlanta a few years, their main gig was every “Fifth Sunday” for brunch, hence the name. The leader moved from Atlanta about that time and I took over the group and named it “Jules & the Gents”. We started out playing weekly @ dinner clubs for tips as well as at local farmers markets. As the word got out about our sound and through playing at the various markets we were introduced to restaurant owners and were getting offers to play private events. Starting with smaller charity auctions, community BBQ’s, and private parties. Once we had been playing together about 3 years as “Jules & the Gents” we started working with professional booking sites like Gigmasters, Thumbtack, Gigsalad etc. These sites opened up a number of new booking scenarios from weddings and corporate events to larger public concerts which eventually got us rated as a top performing jazz band in 2012 and again in 2014 on Gigmasters. In 2015 CBS local news rated “Jules & the Gents” as the best jazz band for hire in Atlanta. Now we are honored to work with leading Marketing firms in Atlanta like Bill Kaelin Marketing, Laura Burchfield Events, EllyB and more. Currently, we also perform at public venues like the Atlanta Botanical Gardens, Zoo Atlanta, Oakhurst Jazz nights, Sandy Springs Heritage Center and Piedmont Arts Festival. Leading a group of artists/ musicians into any commercial endeavor is challenging. There are so many factors involved in creating and maintaining a band based on talent but that also needs to be 100% professional at all times. This is not just any musician. This is a unique individual that has balanced their creative side while maintaining a strong sense of professionalism. As the leader of “Jules & the Gents” demanding excellence in music and organizational skills is key. This means showing up every time prepared and on time leading by example. Also learning over time that it is crucial to have a solid backup person for every position in the band (except me) as the show must always go on! In addition to always having the right players finding the right gigs is crucial as well. Musicians are often underappreciated and asked to play for free over and over which is a trap we did not let ourselves fall into. As soon as we reached a level beyond playing for tips we never went back. Maintaining the value of your work is important even more so when it comes to the arts. If you want the best then you have to pay for it and as such my players know that it is a top priority for them as well. Jules & the Gents – what should we know? What do you guys do best? What sets you apart from the competition? “Jules & the Gents” delivers an authentic, polished jazz sound with style. 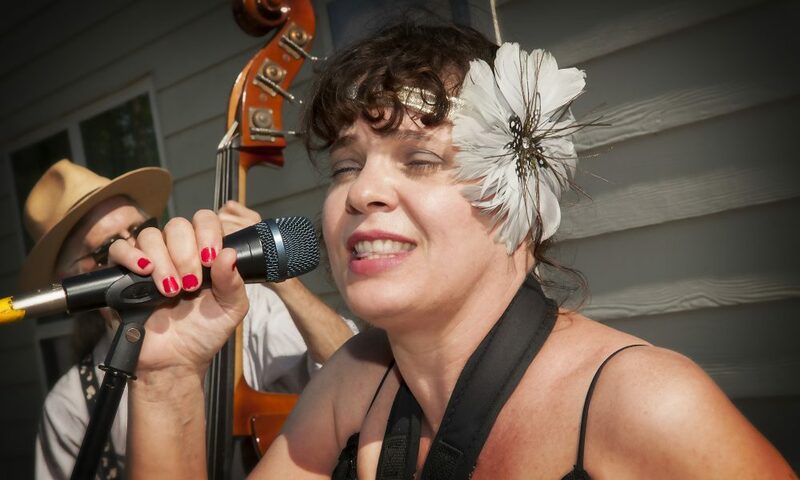 Our Vintage Jazz band plays a select number of the coolest songs from the 20’s, 30’s, 40’s, 50’s & 60’s providing a fabulous genera busting live jazz experience. Julie Stein aka “Jules” has been said to look like a modern Betty Paige with the voice of Peggy Lee. She leads the group with soulful vocals, melodic flute, bluesy saxophone and beautiful stage presence. Rhythm section Doug Rolph (Upright Bass) and Bob Rice (Percussion) have been playing in multiple bands since the late 90’s and make a solid backbone for the ultimate in choice standards. Carl Basler (Guitarist) has an amazing true jazz and blues, tap your toe solos, filling out what many referred to as an “ear candy” mix. Don’t only take our word for it “Jules and the Gents” topped the list for “Best Jazz Bands in Atlanta” on CBS Local news in 2015. If you’re seeking an out of the ordinary vintage vibe that’ll have you jump, jiving and wailing, we are it. “Jules & the Gents” music transcends the ages, performing the coolest old school swing, jazz, blues, big band, sambas and ballads in an authentic style making the oldest to the youngest guest smile. Success in the music world is a relative term, as some may say you don’t make it until you are a huge star selling out stadiums. To us performing live for select audiences who have a celebration or event by bringing a level of excitement and joy only live music brings is indeed success. We are not likely to be the next pop sensation but we do entertain and perform music that makes the entire room smile and we leave with the proper funding for our endeavor. Being able to make a living playing music you love is indeed a reward in itself.